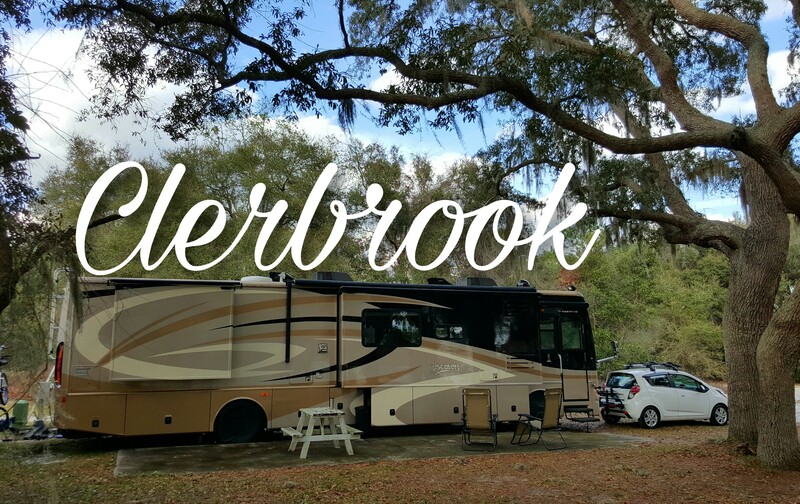 Notes about the surrounding area: Both Thousand Trails Orlando and Clerbrook have a Clermont, FL mailing address, but Clerbrook is much closer to the actual city of Clermont. Like TT Orlando, Clerbrook is also located on US Hwy 27 (just 20 miles north), which is a four-lane divided highway. The park is only about two miles south of the Turnpike, so access is very big-rig friendly. There are many restaurants and gas stations about six miles south of Clerbrook. Included in that area are some of our favorites in the entire region; The Crooked Spoon, Corelli’s Pizza and Donut King. Clermont has basically everything you could want; Walmart, multiple grocery stores, tons of chain restaurants, movie theater, and some great parks. Waterfront Park on Lake Minneola is an incredible place! It has a sandy beach, swim area, a kid’s splash park (which costs money), and it is located directly on one of the many, interconnecting, incredible bike trails that extend all the way into the neighboring town of Winter Garden. Speaking of Winter Garden, they have an amazing, revitalized downtown area which we highly recommend checking out. Nearby, there is a Camping World and a couple other RV dealerships with extensive parts departments. There is a good selection of touristy activities in the area also! The Citrus Tower is six miles away, the Lakeridge Winery is less than a mile down the road, multiple citrus stands, and all that Disney has to offer is within a 30-40-minute drive. If you happen to be around during the first Friday of the month, we highly recommend heading to downtown Clermont for their “First Fridays” event. They bring in a large selection of food trucks, local craft vendors, and various music acts to the downtown streets and admission is free. Particular notes about this campground and/or sites: This is a very large park at over 1,200 sites. Many of those sites are occupied by seasonal or annual residents and many of those have park model homes on those sites. There is a full-size 18-hole golf course within the resort, which sets it apart from many other parks and increases the usual golf cart traffic to a new level. The park is divided into 3 different sections (Lifestyle, Veranda, and Crossroads). Each section has its own rec center and pool, but residents are able to use any of the amenities, no matter where they’re staying. Many sites are grass, but some have concrete patios – presumably left over from previous long-term tenants. All sites in Clerbrook are 50/30 amp with sewer and water. Clerbrook is an Encore park. Encore is owned by Equity Lifestyle Properties, which also owns Thousand Trails. During the winter months, they allow Thousand Trails members to use selected, local Encore parks as “overflow” for Thousand Trails Orlando. This is due to the sheer number of campers in the area during that time of year. Clerbrook has been one of these overflow parks last year and this year (possibly before that, but we weren’t around at that point). The overflow parks can change from year-to-year. Thousand Trails members may use the same privileges that they have for Thousand Trails Orlando at the overflow parks. For us, this means that we can stay for 14 days during the winter (due to high-use restriction). Members cannot go from Orlando directly to an overflow park – the overflow parks are to be treated as if they are the same as Thousand Trails Orlando, not additional parks in the membership. A note for TT members, since this is not an actual TT park, sites are not first-come, first-serve. The office assigns sites based on your membership and not all areas of the park are available to all members. Also, TT members must call in to make reservations at overflow parks – they cannot be reserved on the website. Amenities: The previously mentioned 18-hole golf course is the crown jewel of Clerbrook’s amenities. We are not golfers, so I do not know all the info and cost for playing at this course, but I do know that it seems to stay quite busy. There is also an accompanying driving range. As mentioned, there are a total of three pools and three rec centers throughout the park. There is also shuffleboard, horseshoes, a basketball court, fishing ponds, a dog park, and a full-size softball field. Due to the number of long-term residents, they have softball leagues within the park. Park staff also seem to have many activities for residents including day trips, happy hours, holiday events, etc. Some of the events cost extra. Somewhat peculiarly absent are any racquet sports, such as tennis and pickleball. They advertise WiFi throughout the park – some which is free and some which must be purchased. We have heard that it is currently inoperable and has been for quite some time. Not our favorite site here, but no complaints! Our experience: Due to the flooding at Peace River, we spent a considerable amount of time at Clerbrook during the 2015/2016 winter. During our first stay, we were put very far back in the park (which is a long way due to its size). It was a grass site – nothing special – but we found that there was a lot of Stinging Nettle that had been cut down with the grass. For anyone who is unfamiliar with Stinging Nettle, try to stay that way, but it’s a plant which has very small hair-like needles which will stick in exposed skin (flip-flop wearers beware) and cause a stinging, burning feeling, similar to a bee sting. During our next stay, we were assigned a site much closer to the entrance. It was in a really nice wooded area and this particular site had a large concrete slab for a patio (pictured in this article’s title). Even though it was very shaded, I was able to pull in Dish Network by running my portable dish only a few feet away from the coach. This site became our favorite and we would call to request it after making our reservation each time. Unfortunately, our favorite site was reserved during our current stay, so we must not be the only ones who found it to be awesome. I would tell you the site number, but I can’t have all of you taking it! SOH Score (1-10, 10 being the best campground imaginable): 7 – It’s very similar to Thousand Trails Orlando in location, quality of sites, quality of amenities, and the price is super (no cost for us)!! As a bonus, it’s very much like “coming home” for us since our last house was about 7 miles away. Enjoyed the area just never got to stay more than two weeks,great weather. It’s pretty insane down here during the winter, RV wise. US 27 is a parade of RV’s every day. But with this kind of weather, it’s no mystery why it’s like this.